Color X is a stylish Keynote template that comes with 40 unique slides featuring modern designs and color themes. It includes lots of creative graphics, charts, and customizable vector elements. More importantly, the slides come with transitions and animations as well. 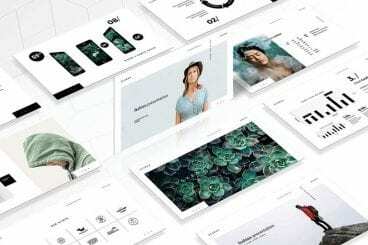 Simpleco is a creative Keynote template made for designing presentations for business and marketing purposes. It includes useful charts, pricing tables, projections slides, and more for creating effective presentations. The template features 93 unique slides filled with animations and in 2 different color themes. If you’re working on a marketing related presentation, this Keynote template will definitely come in handy. It comes with more than 40 unique slides featuring object and slide transition animations. You’ll also be able to choose from either light or dark color background themes for the slides as well. Crystal is a modern and elegant Keynote template that features a clean and minimal design. The template comes with 30 unique slides carefully made for business, agency, and professional presentations. It also features smooth transition animations to make your slideshow look more creative. This highly minimalist and professional Keynote template comes to you in 2 different versions: An animated version and a static non-animated version. It includes more than 120 unique slides and features a pack of 4000 minimal icons as well as infographics, charts, and lots of other vector graphics. Despite the name, this Keynote template is actually a multipurpose template that can be used to create many kinds of presentations. It comes with 130 unique slides featuring easily customizable transition and object animations. You can also edit the vector objects and icons to change colors and resize however you like. Agency Keynote template comes with 21 unique slides featuring both animated and static versions of the template. You’ll also be able to choose from 7 different premade colors variations of this template to create a presentation that fit your brand and business. This Keynote template is perfect for creating a presentation for showcasing your business plans, project proposals, and projection slideshows. The template features 100 unique slides in 5 different premade color schemes. It’s also available in both animated and static slideshow variants. Pitch is a modern Keynote presentation template you can use to make pitch decks and startup related slideshows. The template includes more than 120 unique slides and they are available in 6 different color schemes with a total of 800 slides. You can also easily change its fonts, colors, and resize shapes and icons to your preference. This Keynote template is made for creating all kinds of business report meeting presentations, including marketing, sales, and projection reports. The template comes with 30 unique slides featuring both animated and static versions. The slides are also available in 6 different premade color schemes as well. This modern Keynote template comes with more than 896 slides featuring 110 unique slides in 6 different premade color schemes. The minimalist and clean design of the slides makes it perfect for creating presentations for marketing and sales related slideshows. It includes customizable transition animations and lots of vector elements. Edge Keynote template features a modern and clean design. It features minimal colors and comes in both animated and non-animated versions. The template comes with more than 220 unique slides you can use to create a compelling business related presentation slideshow. As a bonus, it comes with PSD mockup templates as well. Voda comes with a dark and modern slide design featuring stylish transition animations. The Keynote template includes 80 unique slides available in 5 premade color schemes, making a total of 240 slides. It includes lots of charts, graphs, infographics, and editable icons as well. Cardinal is a Keynote template made specifically for business and personal slideshow presentations. It comes with 25 unique slides in 3 different color schemes and with dark and light themes. Each template also features creative slide transition animations and lots of editable vector elements. Moda is a stylish Keynote template that features slides full of images and graphics. It’s ideal for creating presentations for fashion and photography related business and professionals. The template comes with 40 unique slides filled with effective transition animations. The slides are also available in 3 different color themes. Just as the name suggests, this Keynote template is the perfect choice for creating a slideshow for presenting your monthly marketing, sales, and other business related plans and projections. The template 50 unique slides available in 10 premade color schemes and with animated and static versions. If you’re having a tough time figuring out which template to use for your presentation, grab this bundle. It comes with 3 different multipurpose Keynote templates featuring various designs and a total of 463 unique slides.